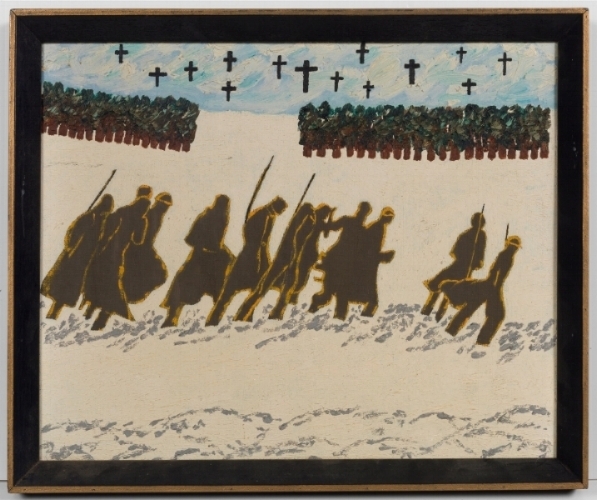 CHICAGO, IL–-Intuit: The Center for Intuitive and Outsider Art announces its upcoming exhibition, Darger + War: Violence and Loss in Self-Taught Art, opening Friday, September 15, as part of Intuit’s yearlong celebration of Chicago outsider artist Henry Darger’s 125th birthday. War has impacted artists across time – from the classically trained to those who turned to art therapy to cope with post-traumatic stress disorder. Through more than 50 paintings, sculptures and drawings, Darger + War: Violence and Loss in Self-Taught Art explores the complex intersection of art and war through the lens of self-taught art, and investigates war as a narrative, as an experience and as a state of mind. The world of Henry Darger (1892-1973) was fraught with war. During his lifetime, the United States fought in numerous wars, including the Spanish-American War, World Wars I and II, the Korean War, and the Vietnam War. Though Darger never saw conflict or served abroad firsthand (he was drafted in 1917 and honorably discharged three months later), his artworks both anticipate and reflect the violence of warfare. Darger had a lifelong interest in the Civil War, one inspiration for his 15,000-page good-versus-evil novel known as In the Realms of the Unreal, which chronicles a conflict of Darger’s making, the Glandeco-Angelinian War, in which the seven Vivian Girls are heroines in a war against child slavery. Artists represented in this exhibition include Henry Darger, Gregory Van Maanen, Dr. Charles Smith, Philip Weintraub and more. Darger + War: Violence and Loss in Self-Taught Art opens Friday, September 15, with an opening reception taking place 5:30-8:30 p.m., and will be on view until December 10. Special thanks to the American Folk Art Museum, New York, for its generous loans of artworks and archives. Established in 1991, Intuit: The Center for Intuitive and Outsider Art is one of the premier museums of outsider and self-taught art in the world—with world class exhibitions; resources for scholars and students; a permanent collection of more than 1,200 works of art; the Henry Darger Room Collection; the Robert A. Roth Study Center, a non-circulating collection with a primary focus in the fields of outsider and contemporary self-taught art; and educational programming for people of all interest levels and backgrounds. Intuit is open to the public Tuesday-Saturday, 11 a.m.-6 p.m.; Thursday, 11 a.m.-7:30 p.m.; Sunday, noon-5 p.m.; and Monday school holidays. More information is at www.art.org.